And the ark of the Lord was in the country of the Philistines seven months. B. Question: Can seven months be long period of time? 2. It is an extremely long time when affliction and death are happening every day. 3. It is extremely long when solutions to problems do not bring relief. And the Philistines called for the priests and the diviners, saying, What shall we do to the ark of the Lord: tell us wherewith we shall sent it to his place. A. They called the priests of Dagon and the diviners. C. An interesting statement is made about the diviners of Babylon in Ezekiel 21:21. For the king of Babylon stood at the parting of the way, at the head of the two ways, to use divination: he made his arrows bright, he consulted with images, he looked in the liver. A. The counselled them to send back a trespass offering. C. The whole process that brought about the “gift” is in consideration. 1. The Philistines had learned that they had offended God. They had robbed God of the ark which was rightfully His. 2. Their offence brought guilt to them. It was guilt because they had been afflicted. It was not the guilt of true repentance. 3. Thus, they sought to recompense the offended one by giving Him a gift, a trespass offering. 6. T – F If the people where healed they would know why God’s hand was upon them (I Sam. …then ye shall be healed, and it shall be known to you why his hand is not removed from you. B. Note: The priests and diviners were not completely sure. 2. It shows the weakness of the priests. They did not really communicate with the gods who had divine wisdom. They used their own reasoning and hoped they were right. …according to the number of the Philistines: for one plague was on you all, and on your lords. A. Everywhere the ark had gone in Philistia, the same plague came upon the people. B. The retribution of God was upon the nation. Thus, the five lords represented the nation. Five golden emerods and five golden mice would indicate that the entirety of the nation was involved in the return of the ark. Surely, none of the five would want to be left out. A. This is the first time that we have any information given to us about mice being involved in the plague. B. It appears that mice were sent upon the cities. These mice could carry all kinds of diseases that would infect the Philistines. On the website, Centers for Disease Control and Prevention, they list 11 different diseases directly transmitted by such rodents. They also list 15 other diseases that are indirectly transmitted by mice and other rodents. C. The land of the Philistines was full of sickness, pain, affliction, sorrow and death. A. They advised them to give glory to the God of Israel. B. They did not deny that He existed. They only thought that their gods were more powerful since they had captured the ark in battle. C. Their glory was only an acknowledgement that God was powerful and they had suffered at His hand for a wrong they committed against Him. …peradventure he will lighten his hand from off you, and from off your gods, and from off your land. B. Men have trouble with submission. For some reason, they will hold on to their pride and be afflicted rather than submit to God and find relief. …as the Egyptians and Phahaoh hardened their hearts? When he had wrought wonderfully among them, did they not let the people go, and they departed. B. Three times the Bible says that Pharaoh hardened his own heart (Exo. 8:15, 32; 9:34). Five times the text tells us that Pharaoh’s heart was hardened. Seven times in the account of the plagues, God is said to have hardened Pharaoh’s heart. C. The word “milch” describes them as suckling cows, that is, cows that were feeding calves. B. This means that they had not been tamed to be used to wearing a yoke. Getting a cow used to a yoke was a time-consuming process. Too, the cows when first subjected to the yoke would rebel against it. …and bring their calves home from them. A. They were to remove the calves from the heifers. B. The cows were mothers and allowed their calves to feed when they were hungry. If their calves lowed for them, the mothers would seek them out in order to feed them. And take the ark of the Lord, and lay it upon the cart; and put the jewels of gold, which ye return him for a trespass offering, in a coffer by the side thereof; and send it away, that it may go. A. They were to be put in a coffer. B. Then they were to be put beside the ark on the cart. 1. 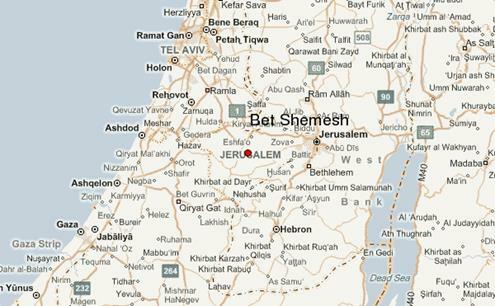 A town located about 19 miles west of Jerusalem. 2. It was a Canaanite city before Israel invaded the land. 4. It was located in the territory of Judah (Josh. 21:16). 5. It was also one of the Levitical cities given to the tribe of Levi. A. If it went to this particular city in the land of Israel, they would know that God’s as involved in their affliction. 3. Take the ark to a particular city, Beth-she-mesh. 22. If the cows did not take the ark to Beth-she-mesh, what would the Philistines know? (I Sam. 6:9). …but if not, then we shall know that it is not his hand that smote us; it was a chance that happened to us. A. If the cows took the ark anywhere but Beth-she-mesh, they would know that all that happened to them was by chance and God was not involved therein. And the men did so; and took two milch kine, and tied them to the cart, and shut up their calves at home: and they laid the ark of the Lord upon the cart, and the coffer with the mice of gold and the images of gold. B. Lesson: Sometimes the heathen are more obedient to their spiritual leaders than the people of God. C. Lesson: When individuals are desperate, they will do things as they are instructed to do them. 24. T – F The kine took the ark to another Philistine city. (I Sam. 6:12). B. Note the description of their travel. C. It is interesting that God allowed the test of the Philistine lords and diviners to be carried out to the letter. He insured that they knew His hand had been upon them. …and the lords of the Philistines went after them unto the border of Beth-shemesh. A. The lords of the Philistines followed the ark themselves. B. They did not leave this to messengers. C. It shows how harsh the judgment had been upon Philistine and how much the lords were interested in resolving this situation. 5. Into whose field did the ark enter? (I Sam. 6:14). 13. What do the words: “which stone remaineth unto this day in the field of Joshua, the Beth-shemite,” help us do? 20. Which city was contacted to come and get the ark? (I Sam. 6:21).